When, in 1889, Martin Kenny handed over 10 shillings to County Treasurer John J. Kehoe, William K. Redmond’s Football Club became the first club from the parish to affiliate to the Wexford Gaelic Athletic Association. The following year the name of the club was changed to Campile Football Club. At that time the Senior Championship was the only competition a club could enter and Campile Football Club were drawn against Vinegar Hill in the 1st round. As was often the case in those days the game ended prematurely. Campile claimed a disputed goal and when the referee decided in Campile’s favour Vinegar Hill would not accept the decision and refused to continue. The game was awarded to Campile. Unfortunately, the campaign ended in the next round when the team was beaten by Glynn. In 1900 a hurling game was played by Ballinamona Young Emmets against Carrigduff Heroes. The team included Lar O'Brien, Ballinamona, John Carroll, The new road, Martin Kent, Horeswood, Michael Caulfield, Coolerin, Mick O'Connor, Killesk, Martin and John Connolly, Great Island, Jim Sinnott, Ballykerogue, Jim Finn, Ballinamona, John Whitty,Coolerin, James Whitty, Killesk, Tim O'Brien, Ballysop, Jim Culleton, Dunbrody, Pat O'Brien, Ballinamona, Tom and Jimmy Fleming, Great Island, Jim Grace, Grange. However, football remained the dominant game and Campile contested three County Junior Football Finals without success in 1909, 1910 and 1912. Two Campile players, brothers Martin and Jack Howlett, Dunbrody, played on the record breaking Wexford Football team of the 1910's. Martin won four All Ireland Senior Medals from 1915 to 1918 and Jack won medals in 1916 and 1917. During the 1920’s hurling enjoyed predominance around the Whitechurch area. Three county Junior Hurling Finals were contested by sides from the parish, in 1928 by Shelburne, 1938 by Campile and 1940 by Sean Finns, but all three ended in defeat. 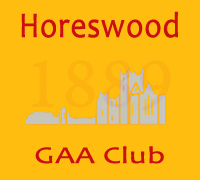 A county title was finally captured in 1944 when Horeswood United won the Minor title. This was followed by a Junior title in 1947 and a place in the senior ranks and coincided with a renaissance in Wexford Hurling. Horeswood were up there with the likes of Rathnure, Cloughbawn and St. Aidan's. They contested three Senior Finals, losing to Cloughbawn after a replay in 1952, and falling to St. Aidan’s in 1952 and 1954. However their exploits did not go unnoticed by the county selectors and Paddy Shannon, John Cummins, John Hearn, Martin Byrne, (who played for many years with Geraldine O'Hanrahans), Dominic Hearn and Mick O'Hanlon all represented the county. Indeed, the latter two won All Ireland Medals; Dominic Hearn in 1955 and Mick O'Hanlon, (who also represented the county at Senior Football level), in 1955 and 1956. Football was now the poor relation, although a County Junior Football Title was won in 1951 and the club spent five years in the Senior grade without any success. Following the retirement of many great players the club returned to the Intermediate hurling grade in 1956. They reached the Final in 1959 but lost to Oylegate. A return to the senior ranks was achieved in 1961, when Mick O'Hanlon at the age of 41 lined out at full back on a team that defeated Oylegate. A fourth Senior Final was contested in 1963 but success still eluded them when they lost to an Oylegate side strengthened by a number of players from Ballyhogue. In 1966 a Special Junior title was won, the last adult county hurling title to come to the parish ( a Junior B District title was won 1999). Although we returned to the Intermediate Grade in 1971, and the club contested county finals in 1982 and 1986, a return to the Senior Ranks was not achieved. Unfortunately we dropped a step further in 2002 when re-graded to Junior. The club joined ranks with neighbouring St. James in the 1960’s and this partnership proved very fruitful. Football especially prospered and three titles followed: the Under-16 and Minor double in 1969 and another Under-16 title in 1977. An Under-16 hurling title was also won in 1967 when additional players from Fethard and Cushinstown strengthened the team. These underage football titles produced many fine players and the club reached the County Junior Final in 1972 but lost to Buffers Alley. Two Intermediate Finals were later contested; in 1977, losing to Starlights and in 1980, this time losing to a young Duffry Rovers side which went on to dominate the Senior grade for many years. In 1986 the club was re-graded back to the Junior ranks. Two years later a 37 year gap was bridged when winning the Junior Championship, thus bringing home the first adult football title since 1951. Following a dominance of underage football in the county in the 1980's and up to the mid 1990's, which included the winning of Minor titles in 1989, 1993, 1995 and 1996 as well as Under 21 titles in 1991, 1994 and 1995, all in the Premier Grade, success was slow to convert to adult level. Another final defeat was suffered in 1994 when losing the Intermediate Final to St. Martins. The long awaited return to Senior Football finally arrived in 1998 when the team swept all opposition aside, including St. James in the Final in O'Kennedy Park, New Ross. While progress was slow in the Senior Grade a first ever Senior Football Final was reached in 2003. Unfortunately, on a day when everything deserted the team, opponents Kilanerin ran out easy winners. All changed in 2005. After a poor display against local rivals Gusserane, the senior team continued in the championship via the losers’ route where they beat Glynn/Barntown by a goal (1-08 - 0-08). The next qualifying round was against Kilanerin (Mattie Ford held scoreless by captain, Darren O'Reilly). Again, the winning margin was three points; 0-12 to 0-09. And so to the quarter-final, where a commanding first half performance enabled Horeswood to progress on a scorline of 3-07 to 0-09. The semi-final threw up Castletown and a five-star performance from David Shannon. 1-06 was a great return from David and his goal will remain long in the memory. Just brilliant. Again, a goal separated the sides, the final scoreline reading 1-11 to 0-11. Wexford Park. The Final. Again. This time a determined team and management were not to be denied. Up against trainer and selector Aidan O'Brien's home club, Adamstown, and led by a dynamic performance from Man of the Match, Ciaran Deely, Horeswood prevailed. A wides tally of only three indicates the concentrated effort put in by the team. Good performances all over the pitch ensured a County Championship at last. Although goalkeeper Diarmuid Hartley and his defence conceded their first goal of the tournament Horeswood won out on a scoreline of 0-14 to Adamstown's 1-08.